If you use CBD oil for your own health, you are already aware of the extensive benefits of cannabinoids. In that case, you already may have a pretty good idea why you might want to give your dog CBD oil supplements. But maybe you have never used CBD oil before, and have no idea why it might be good for you, or your pet. Either way, in this article, I will teach you more about CBD oil and its benefits, and introduce you to one of the most popular brands out there right now for CBD oil supplements for dogs: Canna-Pet. Let’s start by going over some CBD oil basics so that you can understand the health benefits of this amazing supplement. And then I will tell you all about Canna-Pet. What Is CBD Oil and How Can It Help My Dog? Derived from hemp, CBD oil is a natural extract which contains a cannabinoid called cannabidiol. While there are more than 80 known types of cannabinoids, current research suggests that this particular cannabinoid may be the healthiest. CBD helps to regulate the endogenous cannabinoid receptors in your nervous system and brain. This system in turn is responsible for regulating pain response, mood, memory, sleep, and appetite. For this reason, CBD has become a popular supplement for natural, safe pain relief. It also is used to treat epilepsy and mood disorders, combat nausea, fight insomnia, prevent diabetes, and more. Note that CBD oil is not identical to medical marijuana. You can get high on medical marijuana, but neither you nor your pet can get high on CBD oil. CBD oil does not contain THC. THC is the cannabinoid which gets you high when you smoke cannabis. Why Give your Pets CBD Oil Supplements? Cannabinoid receptors in your dog are located not just in the skin, but throughout the body. CBD1 receptors are found in the brain, central nervous system, lungs, muscles, blood vessels, reproductive organs and digestive tract, while CBD2 is found in the pancreas, bone marrow, brainstem, liver, and periphery organs. That means that CBD oil has the potential to act on all of these tissues. If you explore the resources on the Canna-Pet website, you will see that they have compiled quite a few studies in their science section. It is well worth checking out if you want to learn more about how CBD oil may be able to help your pet with these and other health concerns. Now let’s talk more about Canna-Pet. Canna-Pet is based in Seattle, Washington, and manufactures a variety of CBD oil supplements for dogs, cats, and horses—as well as some supplements for humans. Their products were developed with the assistance of veterinarians, medical researchers and scientists. Additionally, all products manufactured by Canna-Pet are made in cGMP laboratories in the United States. All are made using only organic hemp which is certified GMO-free. Products are exclusively vegan and contain NO wheat, gelatin, SLS, preservatives, dairy, sugar, or gluten. How Safe and Reputable are Canna-Pet Supplements? If you run a cursory search on Canna-Pet, you may be alarmed to notice a warning letter from the FDA near the top of the results. I found this alarming too, so I took a close look at it. Here is the letter in question. Reading it, it appears to me that the letter concerns “the marketing of products” rather than the safety of those products. This is actually a very common issue in the supplements market. Basically, the FDA defines one cardinal sin when it comes to marketing supplements, and that is this: the manufacturer cannot claim that they treat or cure a particular disease. A lot of companies violate this rule on the simple basis that it is hard to understand. Indeed, the fine nuances of the rule are quite subtle. The FDA does not mind for example if a supplement is promoted as acting on a certain bodily system, but all references must be very indirect—even if the product’s intended use is as a treatment. To give a relatively simple example, if you formulate a supplement to treat migraines, you can mention that it is used to treat “head pain” in your marketing copy, but not “migraines,” because migraines are regarded as a disease. Likewise, you can say that a CBD oil supplement acts on the endocannabinoid system (ECS), but not that it cures cancer, asthma or so on. So to me, this looks like an innocent mistake, one that plenty of other CBD oil supplement companies are guilty of (indeed, I believe the FDA sent out more than one warning letter to more than one CBD oil company that year). The other reason I can feel confident and safe in recommending Canna-Pet CBD oil for dogs is that this company is actually approved by a couple of major insurance providers, specifically Trupanion and Petplan. So if you have one of these plans and you have the right policy riders and a recommendation from your veterinarian, you may even be able to save money on Canna-Pet products. Now that you know all about Canna-Pet, let’s check out the products they have available for dogs. This is Canna-Pet’s main product for dogs. It is a supplement in capsule form which contains broad-spectrum CBD oil. That means your dog is being nourished by a range of cannabinoids, terpenes and flavonoids with every capsule. It is recommended that you give your pet one capsule twice a day at twelve-hour intervals. The “Advanced Small” formula is designed for pets which weigh less than 20 pounds. The “Advanced Large” formula is designed for pets which weigh more than 20 pounds. As you can see, you do save a little money if you purchase 60 capsules per bottle instead of 30. 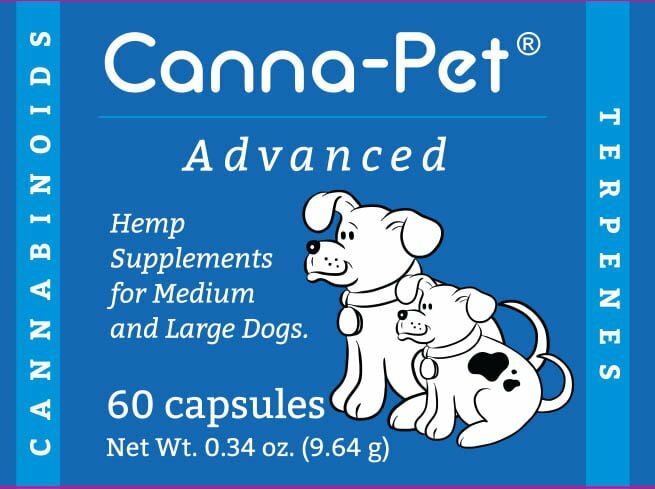 Canna-Pet CBD For Dogs capsules are very affordable. Each capsule contains broad-spectrum CBD oil, not just CBD on its own. That means more nutrition for your pet. Formulas are available which are suitable for either large or small dogs. You do not need to pay a higher price or risk overloading your small dog with too high a dosage. But even if you have a giant breed, you have a powerful product to choose from. Discounts are available if you select auto-shipping at checkout. These are not the most bioavailable or potent CBD oil products offered by Canna-Pet (see below). Searching for an even more powerful CBD oil supplement for your dog? 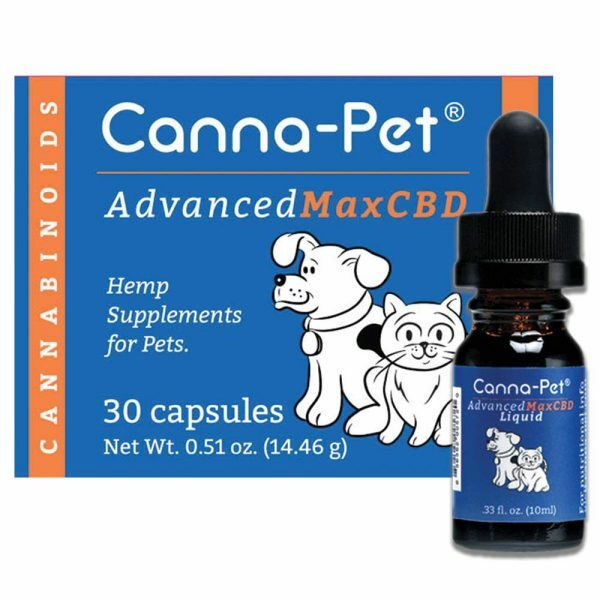 Consider Advanced MaxCBD supplements from Canna-Pet. These supplements contain significantly higher levels of CBD and include additional cannabinoids and terpenes not found in the basic capsules above. They also are formulated for faster, more efficient absorption, increasing bioavailability. Those are some hefty discounts, so they are well worth taking advantage of right now. These capsules are both larger and more concentrated than the original Advanced capsules. If you have a smaller dog, make sure you start with just one capsule per day (split it in two, and spread it across two meals). You may find that is adequate indefinitely. If you have a larger dog, you can go with two capsules. Have a cat? Your feline can take these too. These capsules may be more expensive than the CBD capsules above, but they are also more powerful, which means they are arguably a better deal. There is an even broader spectrum present in MaxCBD, so that means even more support for your dog’s ECS. Fast absorption and higher bioavailability translates to faster relief. There is a liquid form available if you need it. This can be good for a dog that is currently on a liquid diet, or simply has a hard time with the capsules no matter how you try and disguise them. The liquid CBD oil also is absorbed even more quickly than the capsules, and notably can be used for horses as well. If you do need to save money, MaxCBD is not your best option. The first three products cost $16.99, while the MaxCBD one costs $38.99. That one is of course more expensive because it is significantly more potent than the others. You also have the option of purchasing a combined package featuring all three flavors. This regularly sells for $50.97, but currently is going for $39.99. This is a great discount since these are full-size boxes. Non-GMO with tasty organic ingredients. No fillers, additives, or artificial ingredients. Bite-size biscuits are easy to eat, even for small dogs. Three delicious flavors to choose from which are sure to please any canine. These treats are pretty cost-effective. Contains the same formula which you find in the Canna-Pet Advanced capsule formulas. Each box contains around 37-40 biscuits, but you cannot be assured of getting the same amount every time. Canna-Pet also manufactures a line called “Assisi.” Assisi supplements are intended for humans. They are technically the same formulations you find in Canna-Pet supplements for dogs and other animals, but they the company has jumped through some extra hoops so that they can be labeled as safe for human consumption. They are also safe for other mammals. Both capsules and liquid formulas are available. We should have a review up for this line soon. Canna-Pet is a well-known company with a strong reputation. Canna-Pet products are even covered by some pet insurance policies, and quite a few veterinarians across the US recommend the brand to customers. When you purchase from Canna-Pet, you are getting a broad-spectrum CBD oil product which contains no unwanted artificial ingredients—just wholesome natural goodness. There are formulas for large and small dogs available. With capsules, tinctures and dog treats, you can choose the right form of CBD oil supplement for your pet. Some Canna-Pet products also work for cats, horses, and even humans. Canna-Pet supplements are very affordable, and discounts are available. This is a company that cares, and proves it by supporting charities which look after dogs. Charitable organizations can receive up to 50% off on Canna-Pet products. As you can see, there are quite a few pros with Canna-Pet and very few cons, and I did not really find any strong negatives. Q: Will my pet get high using Canna-Pet? A: Absolutely not. Canna-Pet contains NO THC. THC is the compound which gets you high when you use marijuana, not CBD. Your pet will have no psychoactive response whatsoever to Canna-Pet. Q: Can my dog use Canna-Pet while also using other supplements or medications? A: Yes, the company reports that there should be no issues with this as other medications and supplements for dogs act on different pathways. If you have any doubts, ask your vet. Q: Can Canna-Pet be used on an as-needed basis? A: Yes. If for example you have a dog which experiences anxiety on and off in response to certain events, but is not anxious all the time, you could just give your dog Canna-Pet now and again. Say for instance that your dog gets scared during thunderstorms, and you know one is likely on the way. Give your dog Canna-Pet 45 minutes ahead of the storm, and it will have a soothing effect which will help calm your dog’s nerves when the storm arrives. Keep in mind however that you can get the best all-around effects if your pet takes Canna-Pet on a regular, ongoing basis as recommended in the directions for the product you purchase. This also helps to support optimal health not just now, but also over the long-term. Q: What is the best way to feed my dog Canna-Pet? A: You can either hide the capsules in your dog’s food, or you can break them open and stir in the contents. Because they have a mild flavor, your pet shouldn’t have a problem eating them. If however you have a dog which does better with liquid, you can purchase the tincture instead. Dog treats are another option—one which your pets will actually enjoy, complete with delicious flavors and added nutrition. Q: How do I choose a product? A: One of the main considerations is the one just discussed above—it is helpful to pick a product which your dog is likely to take with minimal hassle. A lot of dogs will be able to handle the capsules or the liquid without any issues, but if your dog is particularly fussy, it is best to choose based on experience (or just go with the treats). Regardless of the form of Canna-Pet you pick, remember to get the right formula for your dog’s size. Also think about how important potency is to you. For a milder effect, the “Advanced” formulas are a good option which will save you money. If your dog needs the strongest, fastest formula, go with MaxCBD instead. Even though it costs more, it will deliver maximum effectiveness, and is a solid bang for your buck. Where Can You Buy Canna-Pet? Right now, there are some outstanding discounts being offered on Canna-Pet products, but prices aren’t going to stay low for long. Ready to purchase Canna-Pet so your dog can enjoy all the nutritional benefits of CBD oil in a natural, healthy, affordable supplement? Click the link below. With a 100% satisfaction guarantee, you have nothing to lose—and your dog has everything to gain!